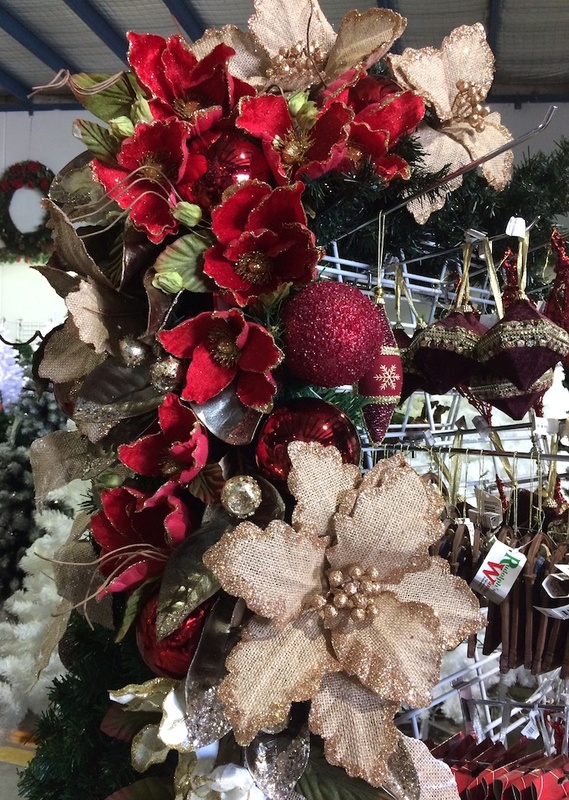 The beginning of the year is an exciting time at Christmas Elves. After the international trade shows I start working on new creative themes for the shop based on popular trends and colours. Key trends for 2017 are Pastel (pink), Botanical (green), Metallics ( blue/grey) and Candy. There are no hard or fast rules but come November these themes will certainly be available in store. At Christmas Elves my first job is to decorate the A frames (a metal stand used to display product). For me it’s a great opportunity to try out new ideas on a smaller scale. I start by covering the side of the frame with plain garland which provides a base for the decoration on top. The decorated A frame can showcase an alternative colour theme or a new product line. It looks good in the shop and provides creative inspiration for customers. Photo, Miss Haberdash Christmas, 2017. Woodland elves A frame. 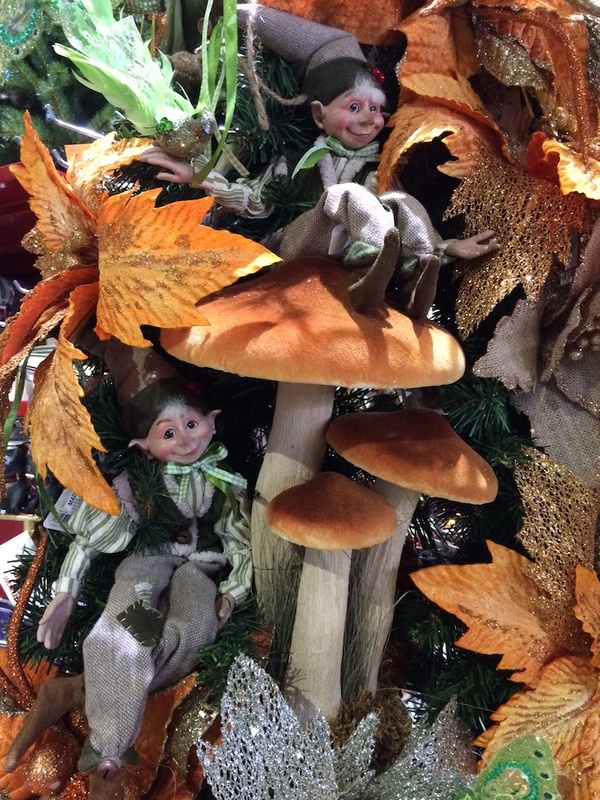 I like to tell a story and larger products like these woodland elves and mushrooms add character to a display. Larger items can be secured to plain garland with cable ties or floristry wire. These items often sell out first so be prepared to replenish if your’re merchandising. Photo, Miss Haberdash Christmas, 2017. Burlap and red magnolia A frame. Unusual colour combinations and interesting textures add variety to floral decorating. Burlap has become a Christmas decorating staple and it’s a neutral that goes well with many vibrant colours such as this bright red. A mix of matt and shiny baubles or a change of scale will add balance to any arrangement. Photo, Miss Haberdash Christmas, 2017. Red ribbon and white magnolia A frame. Photo, Miss Haberdash Christmas, 2017. Teal and blue velvet A frame decoration. Bright colours can break up areas within the store. 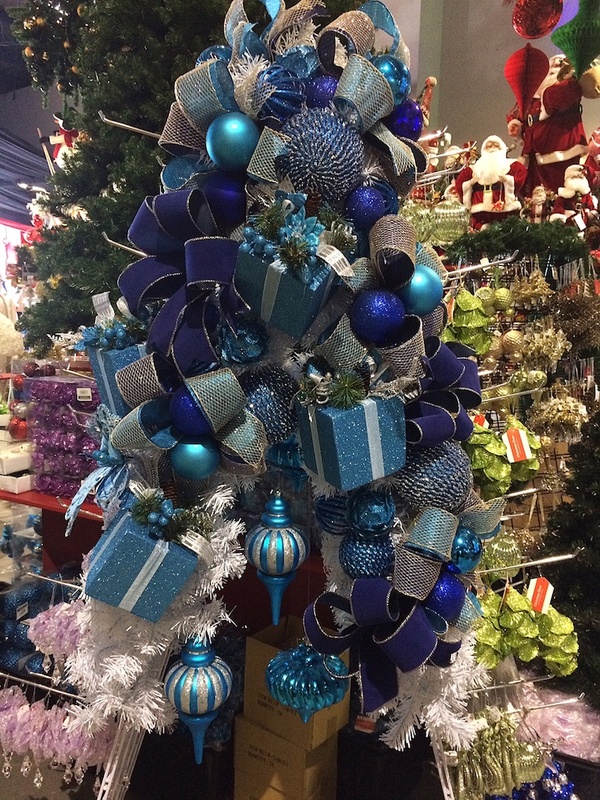 New season products like this blue ribbon look more effective made into bows rather than sold on the roll. Retail staff can demonstrate the bow making technique in store and show the customer how to experiment with colour combinations and textures. It’s also the perfect conversation starter. Photo, Miss Haberdash Christmas, 2017. A frame in delicate pastels.